Bogotá, Colombia was recently named the least safe transit system for women, largely due to an epidemic of sexual assault (defined here as any type of unwanted sexual touching). According to a survey, conducted in Colombia and Bolivia as part of the Lee Schipper Memorial Scholarship last year, 38 percent of female TransMilenio users, Bogotá’s bus rapid transit system, have been assaulted. While the case of TransMilenio is extreme, Bogotá’s system is far from alone in facing this crisis. In El Alto, Bolivia, 20 percent of female users, or one in five, have been assaulted. The conditions within transit systems, such as extreme crowding, isolation and lack of accountability, often contribute to sexual assault and cause perpetrators to go unpunished. However, cultural norms also play a role in normalizing and trivializing violence against women. The sustainable transport community needs to recognize this and work toward changing both conditions and culture—including its own. This constant state of stress and hypervigilance impacts users’ emotional and psychological wellbeing and can erode trust of those around them. Less than half of assault victims on TransMilenio believed their fellow passengers would intervene if they witnessed an assault, as compared to 67 percent of women who had not suffered an assault. 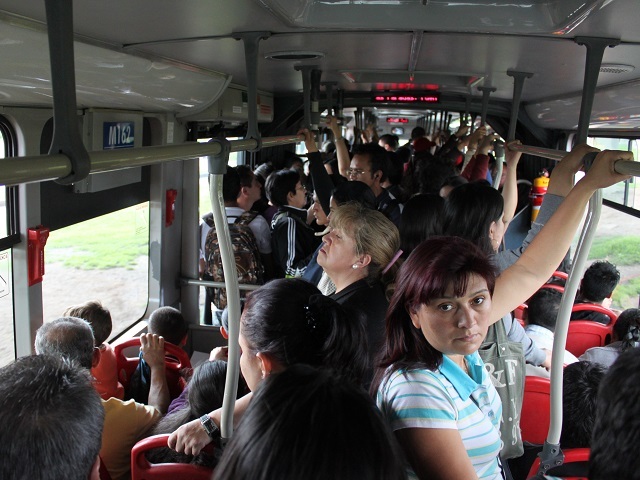 TransMilenio’s legendary crowding creates an atmosphere where riders can harass women with little fear of legal or social consequences. The crowding normalizes very intimate contact with strangers. As a result, physical sensations that would normally be clear indications of assault may be ambiguous. In the most crowded vehicles, it may not even be possible to tell who, of the half-dozen people in one’s immediate proximity, is doing the touching. Both victims and witnesses have discussed feeling unable to intervene because of this ambiguity and anonymity. Even in less crowded conditions, the normalization of intimate contact lowers the chance that the assaulter will be detected. Many women describe feeling someone pressing up against them and assume it’s because of the crowded conditions, only to realize later that the contact was inappropriate. In general, women who did not or could not confront their assaulter in the moment (whether or not they legally reported them), express more negative feelings in the aftermath. While opinions like these are troublingly common, it is worth noting that many respondents, both men and women, wholeheartedly rejected these ideas. However, sexism is not just a problem among transit users. All three of the previous excerpts came from interviews with transit planners of varying ages. When raising awareness about assault on public transit, advocates for sustainable transport must not neglect examining their own perspectives. To successfully address sexual assault on transit, advocates need to raise awareness among both transit users and transit planners that assault is a real problem with serious consequences. It is critical to identify cultural and technical measures to reduce future assaults and make women feel safe using public transport. Drawing on the perspectives of women who have experienced assault will help gauge the effectiveness of potential remedies. For example, based on a victim’s experience with ambiguous assaults, it may be helpful to focus on empowering victims and witnesses to react in a way that avoids conflict. Addressing sexual assault is vital for improving women’s physical and emotional safety as they take transit. In recent months, TransMilenio took an important step toward addressing sexual assault, as representatives met with several victims during the final stage of the Lee Schipper study. While awareness of existing resources, such as the Purple Hotline (offered by the Secretary of Women), is low, new recommendations include targeting awareness campaigns toward both men and women and the training of and building trust in transit police officers.